Happy Halloween! 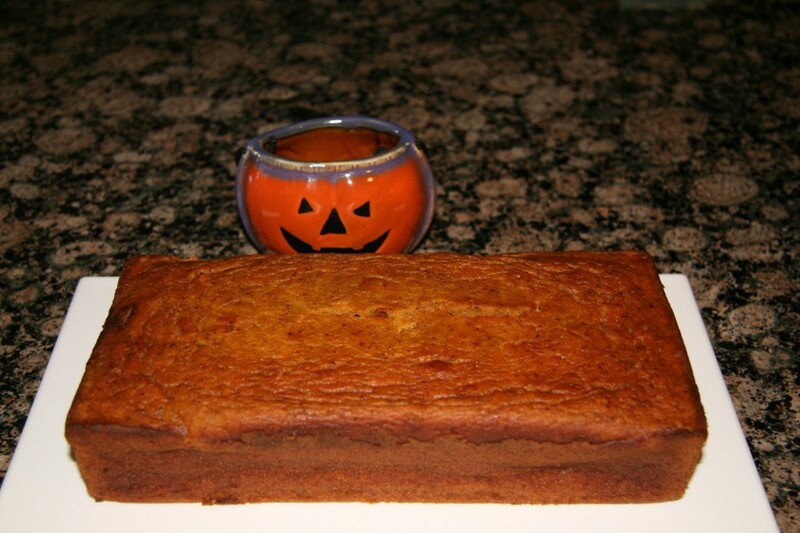 Pumpkin bread, two different ways! I know it’s been a while since I last posted…this is my first blog post from my new house! As you can see, I have granite counter tops (as well as a ton more counter space than in my apartment). Space makes all the difference! I can’t wait to cook and bake for the holidays. I’ve been making this pumpkin bread for years, but this year I decided to double the amount of pumpkin to see how it came out. Instead of a bread-y consistency, it was moist and cake-y. This version is great too, and I would suggest eating it with a dollop of whipped cream or a scoop of ice cream on top. Either way, it’s a great way to bake with pumpkin. Check out my tutorial on how to make fresh pumpkin puree that can be used for breads, pies, and even pumpkin chili! Preheat oven to 350 degrees and spray a loaf pan with Pam cooking spray. In a large bowl, mix the pumpkin, oil, sugar, and eggs. Stir the dry ingredients into the pumpkin mixture until well combined. Pour the batter in the loaf pan and smooth the top with a rubber spatula. Bake in oven for 45-60 minute, until a knife inserted into the center comes out clean. This entry was posted in Breads, Other Desserts. Bookmark the permalink.